To install as a retention tank, the best arrangement is to use the bottom of the tank for the inlet and the top for the outlet. The unused branch of the bottom tee should be used as a drain for cleaning the tank. The inlet/outlet can be reversed. 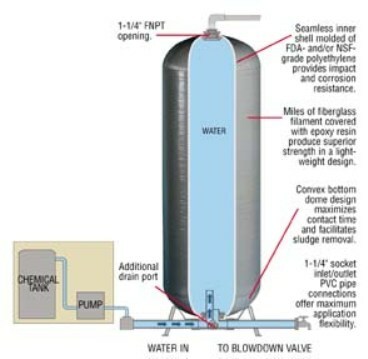 The purpose of the tank is to allow retention time for injected water treatment chemicals or minerals. Pictured: an illustration from the manufacturer's website.